RIO DE JANEIRO, BRAZIL – Spain beat Australia 3-0 this afternoon at the Arena da Baixada in their final game of the 2014 FIFA World Cup. As both sides were already eliminated prior to kick-off only pride was at stake, and the 2010 champions finally managed to get some points on the board, albeit too late to make a difference to this year’s campaign. Spain launch an attack against Australia, image recreation. For Australia, who lost all three of their group games, it was their worst ever performance at a World Cup tournament. Despite running Chile and Holland close in their first two matches, they conceded nine goals in just three outings and managed to score on just three occasions. Spain played a reserve team which conversely played more cohesively than the starters managed previously. Australia was able to threaten but the talent of the Europeans prevailed, especially in the second half. For the Europeans, only Sergio Ramos, Jordi Alva, Xabi Alonso and Andres Iniesta survived the chop from coach Vicente del Bosque. And the new look side took a while to gel, making a slow start to the contest. For the first twenty minutes the Australians were on top but failed to make their pressure count. Fernando Torres had Spain’s first real chance but he saw his effort saved by goalkeeper Mathew Ryan. On 35 minutes Spain went ahead when Juanfran crossed for David Villa to convert. It was to be his last goal in national colors, having announced his retirement from international football before the tournament. 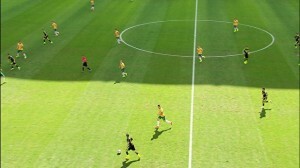 In the second half Australia continued to try to take the game to Spain, but were picked off expertly. On 68 minutes, Iniesta set up Torres to double the Spanish advantage. Nine minutes from time, Juan Mata, one-on-one with Ryan, slipped the ball through the stopper’s legs to wrap up the points. Spain’s next task is to defend their European title in 2016 in France.